The Barry Farm Tenant and Allies Association (BFTAA) held a rally on Aug. 18 to demand input in the next redevelopment plan for their public housing community, along with a halt to demolition in the neighborhood. A large mound of splintered wood and concrete rubble piled up behind the rally site was symbolic of the state of the neighborhood. Roughly 40 people attended, a mix of residents and their supporters, organized by the nonprofit Empower D.C. Of the 444 units previously available, many occupied by families, approximately 80 residents remain as vacant units are torn down. “The Bowser Administration should halt demolition at Barry Farm and let the residents there have a seat at the table to ensure they have the community they want,” said Catherine Cone, an attorney with the Washington Lawyers’ Committee for Civil Rights and Urban Affairs who attended the rally. Barry Farm is one of four public housing projects in the District that was selected to be revitalized and converted to a mixed-income development as part of the New Communities Initiative, a local program that began in 2005 as a response to federal budget cuts to housing programs. Public housing units, like those at Barry Farm, are reserved for seniors, people with disabilities and very low-income families. The D.C. Housing Authority manages 56 properties for more than 20,000 public housing tenants on behalf of the federal government, according to its website. 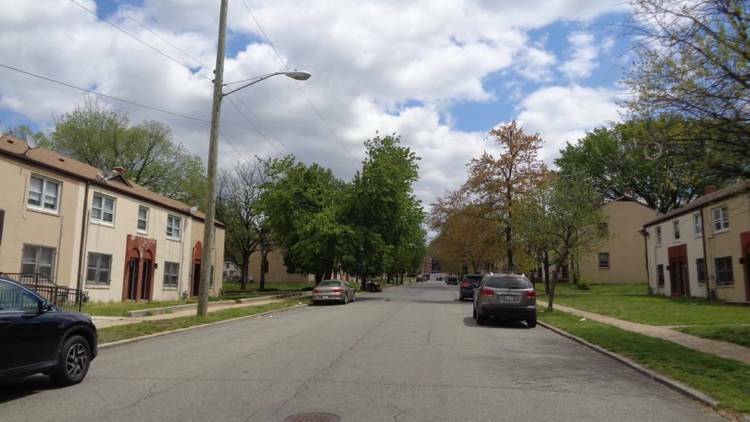 The city’s plan is to raze the neighborhood and build new units, which would be reserved for various income levels, including public housing, workforce housing, market-rate housing and others, partially dependent on the types of funding secured for the project. Amenities such as retail space, schools and recreation facilities are part of each NCI plan. As residents waited, however, fear began creeping in that the gentrification they saw sweep through the city over the past decade — driving up costs, exacerbating disparities, and displacing low-income Black residents — was coming for Barry Farm. The project was slow to start, with new life breathed into it in recent years by a federal planning grant, city budget allocations and private investment. An updated development plan was approved in 2014 to guide construction. Less than a year later, Empower D.C. formed the BFTAA. While disaffected residents may be more organized today, their fears and complaints stated at the Aug. 18 rally mirrored those shared six years ago. The BFTAA is not the official tenants’ association to represent the Barry Farm community to their landlord, the D.C. Housing Authority. However, being recognized as such is one of 18 bullet points on a petition circulated at the rally and posted on the website ActionNetwork.org. Residents interviewed in 2012 feared they or their neighbors would not be able to return to the community after construction if they owed back rent or if they managed to be charged with a felony before moving back. A petition circulated by the BFTAA at the Aug. 18 rally reads “EVERYONE returns – clear all back rent and remove all other barriers to return. As Street Sense Media reported in 2016, the housing authority’s board of commissioners passed an affirmative “right to return” resolution that specifically said current residents or redeveloped communities who are “lease-compliant” will face no new screening requirements, including criminal background checks or credit history, when returning to the new development. This formal measure was an eff ort to lend credibility to a promise the housing authority has been making since the inception of the New Communities Initiative. In 2017, the BFTAA sued the housing authority, claiming the approved development plan discriminated against families by building more one- and two-bedroom units and less three-, four- or five-bedroom units than previously existed on the site. The class-action suit also said the number of public housing units included in the plan did not sufficiently honor the New Communities Initiative tenant of “one-for-replacement,” or not losing any public housing stock to the redevelopment. NCI and the housing authority had aimed to build more than 1,000 units and to maintain the number of public housing units in the area by building 100 additional public housing units as part of two larger affordable housing projects nearby, each approximately three-quarters of a mile away from Barry Farm. Those units have been completed and some former Barry Farm residents have moved into them. Nevertheless, after two years moving through the courts, the D.C. Court of Appeals decided the development team had not adequately consider the “adverse impacts raised by Barry Farm residents” and remanded the plan back to the zoning commission. The legal battle with the BFTAA has not stopped the New Communities initiative and the housing authority from reaching out to the community. A week after the BFTAA rally, NCI co-sponsored the annual Barry Farm Family and Friends Day to connect children of residents with educational and job opportunities. The U.S. Coast Guard and General Services Administration donated backpacks loaded down with enough supplies that they were too heavy for small children to carry home. Meanwhile, representatives from Howard University, D.C. Job Corps, Bright Beginnings Charter School and other vendors manned tables covered in brochures, applications and trinkets. Two hundred and fifty residents attended the fair within the first two hours of the six-hour event, according to Tia Ellis, who was working in the welcome tent. She expected roughly 400 attendees by the end of the day. The Far Southeast Strengthening Collaborative, a support program for low-income D.C. families and is assisting Barry Farm residents with relocation, facilitated the event. In addition to Barry Farm Day, the housing authority frequently organized large community cookouts, educational workshops, one-stop “lease-up” events to meet landlords and more. But as the majority of residents have moved or begun to move, FSSC, Housing Opportunities Unlimited and similar relocation groups have been the focus and most resources have been provided one-on-one. As go-go music played in the background and kids lined up to go on inflatable slides and bounce houses, some attendees and vendors expressed skepticism that even the best of intentions would carry the day once developers got involved. “Gentrification has been a long time coming,” one vendor said, shaking his head with a short laugh. He preferred not to be named. Aaron Dunmore, 66, a member of the Congress Heights Senior Wellness Center who lives at Garfield House, doubts the Barry Farm people he grew up with and still sees regularly will be able to return home once development is complete. He predicted either the rents will go up or long-time tenants would somehow be found not to qualify to return. Due to the judge’s dismissal, there is no plan to guide construction while the development team reconsiders their options. But redevelopment will still happen once a new plan is agreed upon, and demolition is allowed to proceed on schedule. All residents are expected to have moved by the fall. As Street Sense Media previously reported, all residents were given the option to accept a portable Housing Choice Voucher (“Section 8”) or to transfer to another public housing property, of which they are legally entitled to three options. The choice came with a Sept. 30 deadline, after which the housing authority will not have access to the federal funds that provide for relocation vouchers ahead of demotion. As of a July 12 roundtable convened by D.C. Council to discuss the future of Barry Farm, only seven residents were refusing to make that choice. Some are still hoping for other options through the BFTAA. This assessment is at odds with a 2017 fact sheet distributed by the D.C. Housing Authority which stated redevelopment was chosen because the homes are in such poor condition they “cannot be fixed through routine maintenance.” New construction would be “built to last,” according to the fact sheet, and existing public housing structures would be replaced one-for-on. On Sunday, Aug. 26, Empower D.C. wrote in a series of Tweets that Barry Farm residents had received notices from DCHA stating lead paint contamination was discovered during a “risk assessment” that evaluated 55 housing units in the neighborhood in June and July. Further testing in the homes of letter recipients will be necessary. DCHA will convene a resident-only meeting to further discuss.